While many people think of dentures as “false teeth,” new advances in dentistry today have allowed dentists to provide dentures that are anything but artificial looking. Today, your Peoria dentists can hand craft dentures to closely match your natural teeth and make improvements in the appearance of your smile. Advanced materials used to fabricate the dentures are more comfortable, more durable and better fitting than ever before. Call our Peoria, AZ dental office to learn more about dentures and how they can improve your smile! If you have lost most or all of your teeth, complete dentures can replace all of your missing teeth. Complete or full dentures are made when all of your natural teeth are missing. You can have a full denture on your upper or lower jaw, or even both. 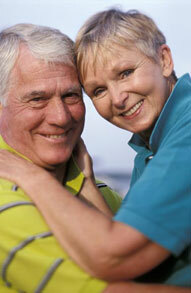 Complete dentures are made when gums are restored to a healthy condition and sufficient time has passed for healing. Gums will naturally shrink through the healing process of tooth loss, which normally takes from 6 to 12 months and during this period immediate dentures may require adjustments to accommodate the changes in the gums and underlying structure. This can include soft and hard relining procedures that are made to the immediate denture. Also known as conventional or immediate, complete dentures can be placed immediately after the removal of the remaining teeth. Immediate dentures can be worn right away, without the healing period. When gums shrink, immediate dentures may require rebasing or relining to fit properly and can be made once the tissues have healed. The healing process may take at least 6-8 weeks. An overdenture is a removable denture that fits over a small number of remaining natural teeth or implants. The natural teeth must be prepared to provide stability and support for the denture. Partial dentures are often a solution when several, but not all, teeth are missing. These dentures usually consist of replacement teeth attached to pink or gum-colored plastic bases, which are connected by metal framework. Removable partial dentures attach to your natural teeth with metal clasps or devices called precision attachments. In order to maintain the natural smile that dentures can provide, you must care for your dentures as you would for your natural teeth. While dentures may have carried a negative stigma in the past, dentures custom-crafted by your dentist today can look, feel and function very closely to your natural teeth. If you, like millions of Americans, suffer from tooth loss, ask your Peoria, AZ dentist if dentures are the right solution for you. For more information on Dentures in the Peoria or Glendale, AZ area, call Your Family Dentist, PC at (623) 878-3300 today!